Central hotel near Frankfurt Hauptbahnhof with a gym, dining and complimentary Wi-FiHoliday Inn® Frankfurt - Alte Oper hotel is close to popular city sights and just an eight-minute walk from Central Station.High-speed trains connect the rail hub to Frankfurt Airport (FRA) in under 15 minutes. If you're driving, we have convenient underground parking. A 10-minute stroll from the hotel takes you to the soaring Main Tower's observation deck for panoramic views. The art-filled Städel Museum is just across the river on the Museum Embankment. You can also reach the Altstadt on foot to see quaint Römerberg square and the Gothic cathedral. Even closer is the hotel’s namesake Old Opera, hosting major classical and jazz concerts. The main shopping area, financial district and Messe Frankfurt's trade fairs are all within easy reach. You can hold an event for up to 90 people in our 2 flexible meeting rooms.At this hotel you can enjoy:- Inclusive Wi-Fi throughout- 24-hour gym- To Go Café- Kids stay and eat freeSavour breakfast dishes from the Chef’s Station and burgers at American-inspired Francis restaurant. Relax with a coffee, snack or cocktail anytime in the welcoming Open Lobby. When you're ready to turn in, serene rooms have nature-themed decor and pillow menus for restful sleep. Take advantage of recreation opportunities including a sauna and a fitness center. Additional amenities at this hotel include complimentary wireless Internet access, shopping on site, and tour/ticket assistance. Satisfy your appetite for lunch or dinner at the hotel's restaurant, L Emir, or stay in and take advantage of the room service (during limited hours). Buffet breakfasts are served on weekdays from 6:30 AM to 10:00 AM and on weekends from 7:00 AM to 10:30 AM for a fee. Featured amenities include a business center, complimentary newspapers in the lobby, and dry cleaning/laundry services. Planning an event in Frankfurt? This hotel has facilities measuring 2024 square feet (188 square meters), including conference space. Self parking (subject to charges) is available onsite. 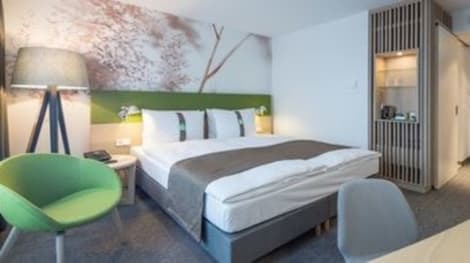 This modern hotel sits in the city centre with good public transport links via Festhalle / Messe station. The hotel offers free wifi, 24-hour reception, a restaurant and bar. Meanwhile, each stylish room has soundproofing, a flat-screen TV, coffee maker, free wifi, and en-suite bathroom with free designer toiletries.